The AdS/CFT correspondence conjectures an exact equivalence between string theories in anti-de-Sitter space and gauge theories. This correspondence and its generalizations allow one to address difficult problems of strongly coupled field theory dynamics - such as the computation of Wilson loops - using weakly coupled gravity. The other way around, it also allows one to tackle fundamental questions of gravity - such as the quantum entropy of black holes - using field theoretic methods. A very important theoretical development of the last decade has been the advent of exact results in supersymmetric field theories using the methods of localization. These methods often reduce path-integrals to finite-dimensional integrals, which in many situations can be computed exactly. Being exact, localization results are most fruitfully applied at strong coupling, and thus provide a powerful framework for producing and exploiting AdS/CFT results. In particular, the interplay of localization and the AdS/CFT correspondence provides a fertile ground to answer precise questions about the entropy of string theoretic black holes and the expectation values of Wilson loops. This Workshop aims to bring together experts in the areas of supersymmetric localization and holography, to provide cross fertilization and outline key directions for the future. 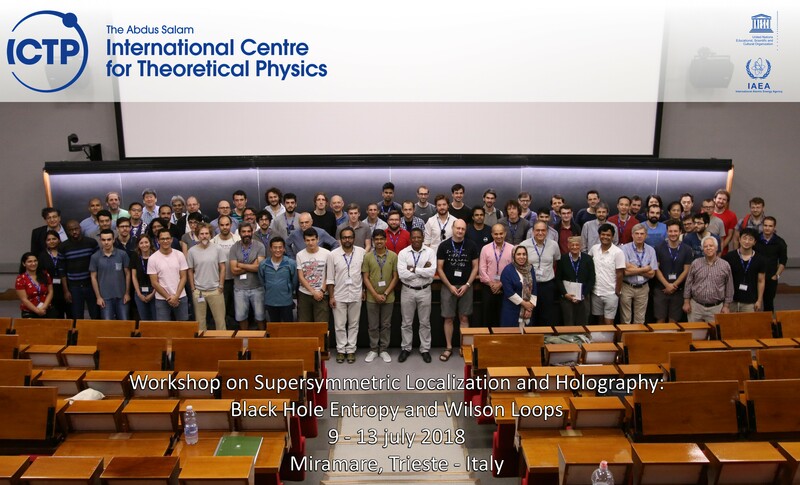 The Workshop will be preceded by a School on Supersymmetric Localization, Holography and Related Topics (smr3256) from 2 to 7 July (http://indico.ictp.it/event/8560), with the goal of providing the necessary basic knowledge through a series of pedagogical lectures by individual speakers. The activity is intended for students in theoretical physics or mathematics and postdocs with knowledge of quantum field theory, general relativity and string theory.